With the aftermath of Hurricane Irma in our South Florida communities and now the tragedy of Hurricane Maria in Puerto Rico, we are reminded of how vulnerable we to increasingly powerful storms. We are fortunate that we did not get the full force of Irma as predicted, but this is not a time for celebration; rather it is an important reason to renew ourselves to being responsible citizens and strengthening our resolve to be active as members of the League of Women Voters. We are absolutely heartbroken over the tragic events that happened Sunday night in Las Vegas and our thoughts are with the victims and their families. Now, more than ever we are committed to our advocacy work on gun safety. Our Chair of Gun Saftey, Letty Pelaez will be keeping us informed of legislative issues as she monitors the monthly calls. As the session begins January 1, this will be a high priority issue for us, contact Letty to join the Gun Safety group. What can you do now? Contact your Member of Congress today and DEMAND common sense gun reform. Use #NotOneMore on social media to show your support. Did you know over 1.6 million Floridians don’t have the right to vote? Consistent with our mission to protect voting rights, learn what LWVMD and our partners are doing to fix this at our general membership meeting. We're honored to have Itohan Ighodaro the Florida Field Director of Restore Voting Rights Coalition and Melba Pearson the Deputy Director of American Civil Liberties Union Florida discuss this campaign as well as what YOU can do to help. On October 1st, Floridians are now able to register to vote and update their voter information online! Yet in implementing this new voter services tool, the LWV of Florida was not provided an opportunity for review and we have several concerns. Pamela Goodman, our LWV FL President, detailed these in a letter to Mr. Ken Detzner, FL Secretary of State and is awaiting his response. Do you think your vote for the POTUS should be weighted less than some other states? WE DON'T! The LWV FL is advocating for the National Popular Vote Interstate Compact to be passed by the Florida Legislature. There have been several successful meetings with legislators and Representative Joe Geller (District 100, Miami) has agreed to sponsor the bill in the Florida house for the 2018 session. If you are interested in working on this issue, contact me, Susan Windmiller. October 9 the LWV MD conducts the monthly board meeting, our meetings are open to our members and we welcome your participation. October 20-21 the LWV FL Leadership Conference is in Orlando. The LWV MD encourages our members to attend this terrific conference. Workshops cover subjects that will help strengthen our leadership skills and enhance our local League. If you are interested in serving the LWV MD in a leadership role, you should plan to attend the conference. Some our Board Members' ability to serve have been impacted due to the aftermath of Hurricane Irma. We are currently looking for a secretary (member of the Executive Committee to attend monthly board meetings and record/report minutes), a Chairperson for Environmental Issues, and a Chairperson for our Solar Initiative, in partnership with Solar United Neighbors (formerly FL SUN). If you want to serve in one of these positions, let me know. Many events were canceled due to Hurricane Irma, including the Family Expo Day by the Children’s Trust and the SD40 Candidate Forum. In the wake of the State of Emergency due to Irma, The LWV FL and MD were on record advocating for fair elections to delay elections along with extending early voting hours. Miami-Dade County Supervisor of Elections did not believe a delay was necessary. LWV FL and MD along with our national and state partners from the Lawyers Committee for Civil Rights, Common Cause, the ACLU, State Voices, Latino Justice, closely monitored the situation and considered many options, including litigation to ensure a fair election. The election was held, and with many observers at polling places, it was declared to have been a clean election. 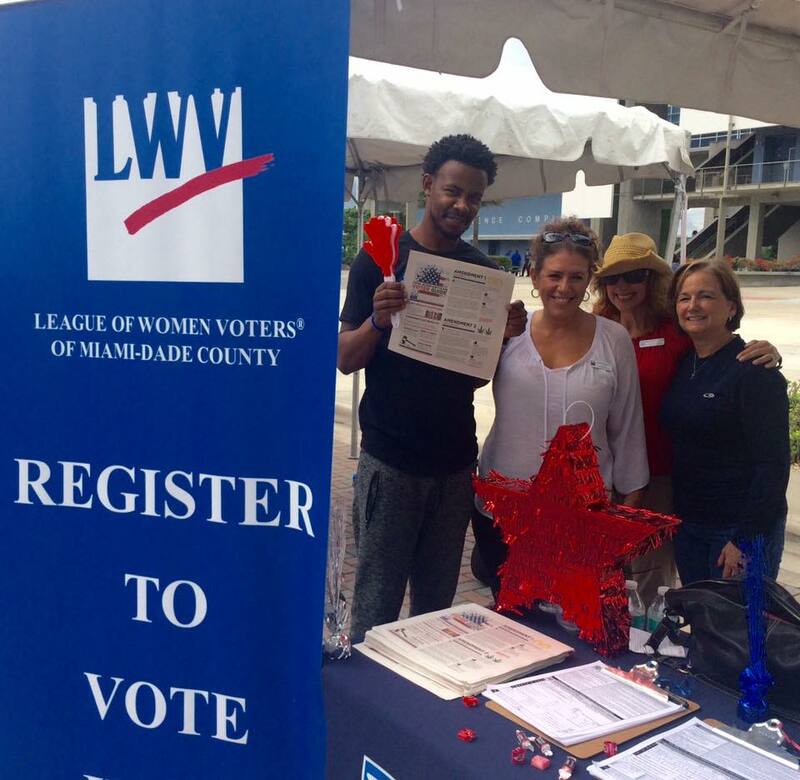 National Voter Registration Day was celebrated with a successful petition signing event in partnership with Miami Dade College Wolfson Campus. The LWV MD attended Charter Review Task Force Meetings testifying on priority issues to abolish the failed strong Mayor form of government and to improve the process for citizen petition initiatives. A post-Irma issue emerged and was stated that the Charter needs to provide for a policy for elections scheduled during a natural disaster or other emergencies as it currently does not. The $7.4 billion County budget was approved, restoring to transportation approximately $15 million of a proposed $30 million reduction, after considerable testimony including by the LWV MD. Lastly, we led discussions post-production at the play, Building the Wall at the Adrienne Arsht Center. The LWV MD continues to lead on the issues – this month working to ensure fair elections post-Hurricane Irma. As a volunteer-led, dues-based organization, we ask that you renew your membership, get your friends to join, attend our events, volunteer your time, donate funds to help us defend our democracy. This is a time of action and involvement. We are counting on you. This has been a thrilling election season! I am proud that the League of Women Voters of Miami-Dade County (LWVMD) has lead this community in preparing for this election. This is Mission Critical time and LWVMD has stepped up to all of its responsibilities to getting citizens informed, registered, and to get out to VOTE! 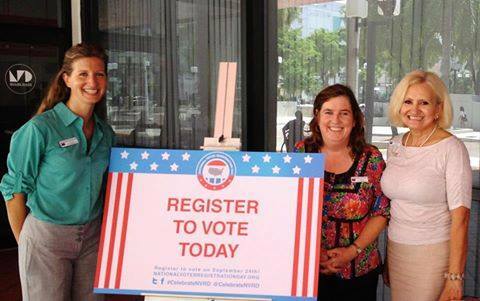 The LWVMD has conducted 17 voter registration events, registering 192 voters! With Judge Walker’s ruling to extend the registration deadline due to Hurricane Matthew, we registered an additional 19 voters, 10 of which are voters casting their first vote. By Election Day, we will have conducted nearly 10 Get Out The Vote (GOTV)/Decoding the Ballot events, held a County Mayoral Debate, conducted candidate forums at the Towns of Bay Harbor Islands, Miami Lakes, and Surfside, and hosted three Cocktails & Conversations where candidates presented their platforms. We also distributed thousands of LWV Florida Amendment Guides, as well as our own signature GOTV cards. LWVMD also published Voters’ Guides for August 30 Primary and the November 8 General Election. This effort involved reaching out to dozens of candidates, and providing analysis on local charter amendments. The Voters’ Guide 2016 is presented online, with wide distribution via social media and an amazing network of community partners, providing voters with the information they need to make informed voting decisions. In spite of these setbacks, our Board has been involved, committed, and dedicated to every aspect of this election season. Every single Director and Officer has participated to make this all possible for our MDC community. We are a volunteer board, and do all of our work – you name it, ourselves. So I congratulate the LWVMD for the amazing and talented women we are, the work we do, with such dedication, passion, and skill. Most importantly, whatever you do before November 8, and however you vote – by mail, early, or in person – visit our online Voters’ Guide 2016. Learn the candidates, and issues, and VOTE! Your vote is your power, your voice, and every vote counts. Voting is what makes our democracy work. If you haven't noticed already, the 2016 election season is in full swing. In Miami-Dade, we will be electing key positions locally, like the Miami-Dade County Mayor, and at the state and federal levels. Stay up to date on how and where to vote and important dates at our Voter's Toolkit and the candidates positions by visiting our Voter's Guide 2016 General Election. The League of Women Voters of Florida and Miami-Dade has taken a STRONG and ACTIVE position to OPPOSE Amendment 1 on the November 8 General Election ballot. Fact 1: Amendment 1 is funded by Florida’s big utilities to protect their monopoly markets and limit customer owned solar. Fact 2: Amendment 1 paves the way for barriers that would penalize solar customers. Fact 3: Amendment 1 misleads Florida voters by promising rights and protections that Florida citizens already have. Amendment 1 misleads Florida voters by promising rights and protections that Florida citizens already have under existing Florida consumer protection laws. There is no reason that restrictive requirements must be placed in the Florida Constitution, which requires 61% approval of Floridians across the state to make ANY changes once it passes. There will not be more or less consumer protections on November 7 or November 9. This amendment is driven by big utilities and is not in the best interest of Floridians, whether you have solar or not. Learn more at Floridians for Solar Choice. The League, Women's Chamber of Commerce of Miami-Dade County, The Women's Fund Miami-Dade, the YWCA of Greater Miami-Dade, successfully partnered to host the Miami-Dade Mayoral Debate for the Primary Election on August 2 at the YWCA. Hundreds of residents attended the debate which was conducted by our media partner WLRN and its Vice President of News, Tom Hudson. Five of the six candidates for Mayor stated their positions to a standing room only audience. The incumbent Mayor did not participate, nor acknowledged the invitation. The League scheduled a debate for the General Election but the incumbent declined the invitation. Together with partners like Univision, Miami Dade College, Children's Trust and the Underline, the League conducted 17 voter registration events, registering 192 voters in three short months. With Judge Walker’s ruling to extend the registration deadline due to Hurricane Matthew, we registered an additional 19 voters, 10 of which are voters casting their first vote. The League, along with its partners, is hosting a the final "Come TogetHER: Like a Woman" event this year as we gather on October 19 at 7:30PM to watch the final 2016 Presidential Debate. Gather your girlfriends, sisters, daughters and join a community of strong, passionate, civically engaged Miami women for a debate watch party and a conversation of how we make an impact in Miami as women during this election season and beyond. Over 50 members and friends attended the LWVMD's monthly Cocktails & Conversations series on September 29 at Tarpon Bend in Coral Gables. Attendees met with candidates and discussed the issues on the November 8 ballot. Join our next Cocktails & Conversation on October 20 at Glass & Vine in Coconut Grove for networking opportunties and the latest information on issues that impact our lives. Join the Miami Climate Alliance and partners to demand climate justice for all people in Miami-Dade County. It is high time to activate Miami as we are ground zero for sea level rise and income inequality. LWVMD's 2016-17 Program, as approved by its membership, advocates for local climate-resilience planning, policy development and funding to equitably reflect the needs of all residents, and supporting the Resilient Miami network. Mark your calendars to support the League on Give Miami Day - Nov 17 - and help us Make Democracy Work by fostering an engaged citizenry that makes for a stronger Miami-Dade community. Your League is registering and protecting voters, educating residents through community forums and advocating for issues like solar choice, gun safety and transparent government. More information forthcoming. Stay up-to-date on future events by following us on Facebook. There are many ways get involved with the League as it registers voters, engages and educates voters, and advocates on issues. You can become a member, volunteer, support or donate through will and planned gifts. The League encourages prospective donors to seek counsel of their own -legal, financial and tax advice in matters pertaining to charitable gifts. Before making a gift of securities or a planned gift, contact the League at 305 666-0186 of info@lwvmiamiamidade.org.